We are really happy and proud to have received this position, and we would like to thank Feedspot for this nomination. We try to pick interesting subjects, Greek food trends, season’s dishes and costumes, and all that you need to know about Greek Food Ingredients, and their connection to the Greek gastronomy. 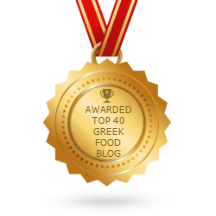 Thank you all for reading our blog, following us in social media and loving what we love, Greek foods! Greek Brands is a Fine Foods export company, serving Greek fine foods worldwide since 1999.